Much of Durkheim's work was concerned with how societies could maintain their integrity and coherence in modernity, an era in which traditional social and religious ties are no longer assumed, and in which new social institutions have come into being. His first major sociological work was The Division of Labour in Society (1893). In 1895, he published The Rules of Sociological Method and set up the first European department of sociology, becoming France's first professor of sociology. In 1898, he established the journal L'Année Sociologique . Durkheim's seminal monograph, Suicide (1897), a study of suicide rates in Catholic and Protestant populations, pioneered modern social research and served to distinguish social science from psychology and political philosophy. The Elementary Forms of the Religious Life (1912) presented a theory of religion, comparing the social and cultural lives of aboriginal and modern societies. Modernity, a topic in the humanities and social sciences, is both a historical period, as well as the ensemble of particular socio-cultural norms, attitudes and practices that arose in the wake of the Renaissance—in the "Age of Reason" of 17th-century thought and the 18th-century "Enlightenment". Some commentators consider the era of modernity to have ended by 1930, with World War II in 1945, or the 1980s or 1990s; the following era is called postmodernity. The term "contemporary history" is also used to refer to the post-1945 timeframe, without assigning it to either the modern or postmodern era. 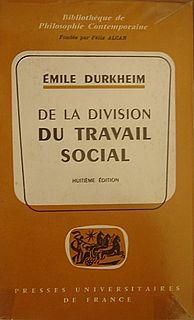 The Division of Labour in Society is the doctoral dissertation of the French sociologist Émile Durkheim, published in 1893. It was influential in advancing sociological theories and thought, with ideas which in turn were influenced by Auguste Comte. Durkheim described how social order was maintained in societies based on two very different forms of solidarity – mechanical and organic – and the transition from more "primitive" societies to advanced industrial societies. Durkheim was also deeply preoccupied with the acceptance of sociology as a legitimate science. He refined the positivism originally set forth by Auguste Comte, promoting what could be considered as a form of epistemological realism, as well as the use of the hypothetico-deductive model in social science. For him, sociology was the science of institutions, if this term is understood in its broader meaning as "beliefs and modes of behaviour instituted by the collectivity"  and its aim being to discover structural social facts. Durkheim was a major proponent of structural functionalism, a foundational perspective in both sociology and anthropology. In his view, social science should be purely holistic;  that is, sociology should study phenomena attributed to society at large, rather than being limited to the specific actions of individuals. Morality is the differentiation of intentions, decisions and actions between those that are distinguished as proper and those that are improper. Morality can be a body of standards or principles derived from a code of conduct from a particular philosophy, religion or culture, or it can derive from a standard that a person believes should be universal. Morality may also be specifically synonymous with "goodness" or "rightness". Emile Durkheim was born in Épinal in Lorraine, the son of Mélanie (Isidor) and Moïse Durkheim. He came from a long line of devout French Jews; his father, grandfather, and great-grandfather had been rabbis. He began his education in a rabbinical school, but at an early age, he decided not to follow in his family's footsteps and switched schools. Durkheim led a completely secular life. Much of his work was dedicated to demonstrating that religious phenomena stemmed from social rather than divine factors. While Durkheim chose not to follow in the family tradition, he did not sever ties with his family or with the Jewish community. Many of his most prominent collaborators and students were Jewish, and some were blood relations. Marcel Mauss, a notable social anthropologist of the pre-war era, was his nephew. One of his nieces was Claudette (née Raphael) Bloch, a marine biologist and mother of Maurice Bloch, who became a noted anthropologist. Épinal ; is a commune in northeastern France and the capital (prefecture) of the Vosges department. Inhabitants are known as Spinaliens. In Judaism, a rabbi is a teacher of Torah. The basic form of the rabbi developed in the Pharisaic and Talmudic era, when learned teachers assembled to codify Judaism's written and oral laws. The first sage for whom the Mishnah uses the title of rabbi was Yohanan ben Zakkai, active in the early-to-mid first century CE. In more recent centuries, the duties of a rabbi became increasingly influenced by the duties of the Protestant Christian minister, hence the title "pulpit rabbis", and in 19th-century Germany and the United States rabbinic activities including sermons, pastoral counseling, and representing the community to the outside, all increased in importance. Marcel Mauss was a French sociologist. The nephew of Émile Durkheim, Mauss' academic work traversed the boundaries between sociology and anthropology. Today, he is perhaps better recognised for his influence on the latter discipline, particularly with respect to his analyses of topics such as magic, sacrifice, and gift exchange in different cultures around the world. Mauss had a significant influence upon Claude Lévi-Strauss, the founder of structural anthropology. His most famous book is The Gift (1925). 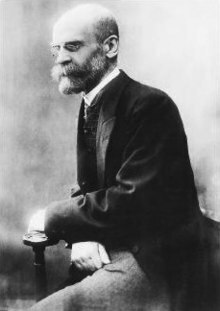 Durkheim's period in Germany resulted in the publication of numerous articles on German social science and philosophy; Durkheim was particularly impressed by the work of Wilhelm Wundt. Durkheim's articles gained recognition in France, and he received a teaching appointment in the University of Bordeaux in 1887, where he was to teach the university's first social science course. His official title was Chargé d'un Cours de Science Sociale et de Pédagogie and thus he taught both pedagogy and sociology (the latter had never been taught in France before). The appointment of the social scientist to the mostly humanistic faculty was an important sign of the change of times, and also the growing importance and recognition of the social sciences. From this position Durkheim helped reform the French school system and introduced the study of social science in its curriculum. However, his controversial beliefs that religion and morality could be explained in terms purely of social interaction earned him many critics. In 1895, he published The Rules of Sociological Method ,  a manifesto stating what sociology is and how it ought to be done, and founded the first European department of sociology at the University of Bordeaux. In 1898, he founded L'Année Sociologique , the first French social science journal. Its aim was to publish and publicize the work of what was, by then, a growing number of students and collaborators (this is also the name used to refer to the group of students who developed his sociological program). In 1897, he published Suicide , a case study that provided an example of what the sociological monograph might look like. Durkheim was one of the pioneers of the use of quantitative methods in criminology during his suicide case study. By 1902, Durkheim had finally achieved his goal of attaining a prominent position in Paris when he became the chair of education at the Sorbonne. Durkheim aimed for the Parisian position earlier, but the Parisian faculty took longer to accept what some called "sociological imperialism" and admit social science to their curriculum. He became a full professor (Professor of the Science of Education) there in 1906, and in 1913 he was named Chair in "Education and Sociology". Because French universities are technically institutions for training secondary school teachers, this position gave Durkheim considerable influence—his lectures were the only ones that were mandatory for the entire student body. Durkheim had much influence over the new generation of teachers; around that time he also served as an advisor to the Ministry of Education. In 1912, he published his last major work, The Elementary Forms of The Religious Life . A second influence on Durkheim's view of society beyond Comte's positivism was the epistemological outlook called social realism. Although he never explicitly exposed it, Durkheim adopted a realist perspective in order to demonstrate the existence of social realities outside the individual and to show that these realities existed in the form of the objective relations of society. As an epistemology of science, realism can be defined as a perspective that takes as its central point of departure the view that external social realities exist in the outer world and that these realities are independent of the individual's perception of them. This view opposes other predominant philosophical perspectives such as empiricism and positivism. Empiricists such as David Hume had argued that all realities in the outside world are products of human sense perception. According to empiricists, all realities are thus merely perceived: they do not exist independently of our perceptions, and have no causal power in themselves. Comte's positivism went a step further by claiming that scientific laws could be deduced from empirical observations. Going beyond this, Durkheim claimed that sociology would not only discover "apparent" laws, but would be able to discover the inherent nature of society. Unlike his contemporaries Ferdinand Tönnies and Max Weber, he did not focus on what motivates the actions of individuals (an approach associated with methodological individualism), but rather on the study of social facts . Durkheim defines morality as "a system of rules for conduct". His analysis of morality is strongly marked by Immanuel Kant and his notion of duty. While Durkheim was influenced by Kant, he was highly critical of aspects of the latter's moral theory and developed his own positions. Durkheim had an important impact on the development of Anthropology and Sociology, influencing thinkers from his school of sociology, such as Marcel Mauss, but also later thinkers, such as Maurice Halbwachs, Talcott Parsons, Alfred Radcliffe-Brown, and Claude Lévi-Strauss. More recently, Durkheim has influenced sociologists such as Steven Lukes, Robert N. Bellah, and Pierre Bourdieu. His description of collective consciousness also deeply influenced the Turkish nationalism of Ziya Gökalp, the founding father of Turkish sociology. Randall Collins has developed a theory of what he calls interaction ritual chains, which is a synthesis of Durkheim's work on religion with Erving Goffman's micro-sociology. Goffman himself was also deeply influenced by Durkheim in his development of the interaction order. ↑ "Emile Durkheim's Life and Works (1857–1917)". ↑ Tiryakian, Edward A. (2009). For Durkheim. ISBN 9780754671558. ↑ Meštrović (1993) , p. 37: "While Durkheim did not become a Rabbi, he may have transformed his father's philosophical and moral concerns into something new, his version of sociology." ↑ Collins (1975) , p. 539: "Durkheim was the first to seriously use the comparative method correctly in the scientific sense". ↑ Hassard (1995) , p. 15: "Suicide [...] is indeed the paradigm case of Durkheim's positivism: it remains the exemplar of the sociological application of statistics." 1 2 Durkheim, Emile. (1964). The elementary forms of the religious life. London: Allen & Unwin. ↑ Jones, T. Anthony (June 1981). "Durkheim, Deviance and Development: Opportunities Lost and Regained". Social Forces. 59 (Special Issue): 1009–1024. doi:10.2307/2577978. JSTOR 2577978. 1 2 3 4 Introduction to Sociology (2 ed.). OpenStax. p. 138. ISBN 978-1-947172-11-1 . Retrieved 7 April 2018. ↑ Sociology: Understanding and Changing the Social World; Explaining Deviance (2016 ed.). Section 7.2: University of Minnesota Libraries Publishing. ISBN 978-1-946135-24-7 . Retrieved 7 April 2018. ↑ Bourdieu & Passeron (1967) , pp. 167–168: "For, speaking more generally, all the social sciences now live in the house of Durkheimism, unbeknownst to them, as it were, because they walked into it backwards." ↑ Carls, Paul. "Émile Durkheim (1858—1917)". Internet Encyclopedia of Philosophy. Retrieved 15 November 2017. ↑ Thompson, Prof Kenneth (2012-10-12). Readings from Emile Durkheim. Routledge. p. 148. ISBN 9781134951260 . Retrieved 15 November 2017. Anomie is a "condition in which society provides little moral guidance to individuals". This evolves from conflict of belief systems and causes breakdown of social bonds between an individual and the community. In a person this can progress into a dysfunctional ability to integrate within normative situations of their social world e.g., an unruly personal scenario that results in fragmentation of social identity and rejection of values. Conflict theories are perspectives in sociology and social psychology that emphasize a materialist interpretation of history, dialectical method of analysis, a critical stance toward existing social arrangements, and political program of revolution or, at least, reform. Conflict theories draw attention to power differentials, such as class conflict, and generally contrast historically dominant ideologies. It is therefore a macro-level analysis of society. Collective consciousness, collective conscience, or collective conscious is the set of shared beliefs, ideas, and moral attitudes which operate as a unifying force within society. The term was introduced by the French sociologist Émile Durkheim in his The Division of Labour in Society in 1893. Jean-Marie Guyau was a French philosopher and poet. Steven Michael Lukes FBA is a British political and social theorist. Currently he is a professor of politics and sociology at New York University. He was formerly a professor at the University of Siena, the European University Institute (Florence) and the London School of Economics. Suicide is an 1897 book written by French sociologist Émile Durkheim. It was the first methodological study of a social fact in the context of society. 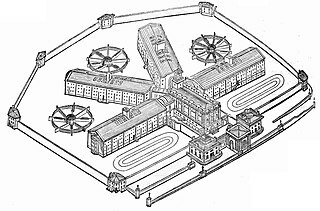 It is ostensibly a case study of suicide, a publication unique for its time that provided an example of what the sociological monograph should look like. 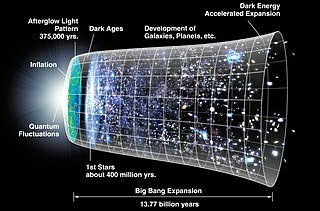 Sociological and anthropological theories about religion generally attempt to explain the origin and function of religion. These theories define what they present as universal characteristics of religious belief and practice. The Elementary Forms of Religious Life, published by the French sociologist Émile Durkheim in 1912, is a book that analyzes religion as a social phenomenon. Durkheim attributes the development of religion to the emotional security attained through communal living. His study of totemic societies in Australia led to a conclusion that the animal or plant that each clan worshipped as a sacred power was in fact that society itself. Halfway through the text, Durkheim inquisites that, "So if [the totem animal] is at once the symbol of the god and of the society, is that not because the god and the society are only one?" It must respect and apply a recognized objective scientific method, bringing it as close as possible to the other exact sciences. This method must at all cost avoid prejudice and subjective judgment. Berk, Bernard B. (2006). "Macro-micro relationships in Durkheim's analysis of egoistic suicide". Sociological Theory . 24 (1): 58–80. doi:10.1111/j.0735-2751.2006.00264.x. Gibbs, Jack P.; Martin, Walter T. (1958). "A theory of status integration and its relationship to suicide". American Sociological Review . 23 (2): 140–147. doi:10.2307/2088997. JSTOR 2088997. Hayward, J. E. S. (1960a). "Solidarist Syndicalism: Durkheim and DuGuit, part I". The Sociological Review . 8 (1): 17–36. doi:10.1111/j.1467-954X.1960.tb02608.x. Hayward, J. E. S. (1960b). "Solidarist Syndicalism: Durkheim and DuGuit, part II". The Sociological Review . 8 (2): 185–202. doi:10.1111/j.1467-954X.1960.tb01034.x. Johnson, Barclay D. (1965). "Durkheim's one cause of suicide". American Sociological Review . 30 (6): 875–886. doi:10.2307/2090966. JSTOR 2090966. McKinnon, A. (2014). "Elementary forms of the metaphorical life: tropes at work in Durkheim's theory of the religious" (PDF). Journal of Classical Sociology . 14 (2): 203–221. doi:10.1177/1468795x13494130. Bellah, Robert N. (ed.) (1973). Emile Durkheim: On Morality and Society, Selected Writings. Chicago: The University of Chicago Press ( ISBN 978-0-226-17336-8). Cotterrell, Roger (1999). Emile Durkheim: Law in a Moral Domain. Edinburgh University Press / Stanford University Press ( ISBN 0-8047-3808-4, ISBN 978-0-8047-3808-8). Cotterrell, Roger (ed.) (2010). Emile Durkheim: Justice, Morality and Politics. Ashgate ( ISBN 978-0-7546-2711-1). Douglas, Jack D. (1973). The Social Meanings of Suicide. Princeton University Press ( ISBN 978-0-691-02812-5). Eitzen, Stanley D. and Maxine Baca Zinn (1997). Social Problems (11th ed.). Needham Heights, MA: Allyn and Bacon ( ISBN 0-205-54796-6). Giddens, Anthony (ed.) (1972). Emile Durkheim: Selected Writings. London: Cambridge University Press ( ISBN 0-521-09712-6, ISBN 978-0-521-09712-3). Giddens, Anthony (ed.) (1986). Durkheim on Politics and the State. Cambridge: Polity Press ( ISBN 0-7456-0131-6). Henslin, James M. (1996). Essentials of Sociology: A Down-to-Earth Approach. Needham Heights, MA: Allyn and Bacon ( ISBN 0-205-17480-9, ISBN 978-0-205-17480-5). Jones, Susan Stedman (2001). Durkheim Reconsidered. Polity ( ISBN 0-7456-1616-X, ISBN 978-0-7456-1616-2). Lemert, Charles (2006). Durkheim's Ghosts: Cultural Logics and Social Things. Cambridge University Press ( ISBN 0-521-84266-2, ISBN 978-0-521-84266-2). Lockwood, David (1992). Solidarity and Schism: "The Problem of Disorder" in Durkheimian and Marxist Sociology. Oxford: Clarendon Press ( ISBN 0-19-827717-2, ISBN 978-0-19-827717-0). Pickering, W. S. F. (2000). Durkheim and Representations, Routledge ( ISBN 0-415-19090-8). Pickering, W. S. F. (ed.) (1979). Durkheim: Essays on Morals and Education, Routledge & Kegan Paul ( ISBN 0-7100-0321-8). Pickering, W. S. F. (ed.) (1975). Durkheim on Religion, Routledge & Kegan Paul ( ISBN 0-7100-8108-1). Siegel, Larry J (2007). Criminology: Theories, Patterns, and Typologies (7th ed.) Wadsworth/Thomson Learning ( ISBN 0-495-00572-X, ISBN 978-0-495-00572-8). 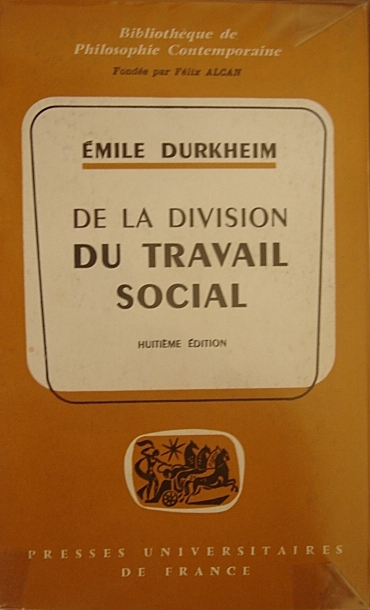 "Émile Durkheim". Internet Encyclopedia of Philosophy .